Peter Chan’s paintings focus on the quiet moments — mediation; prayer; a solitary moment. We encounter his characters immersed in a silence that’s almost palpable. In recent series Fata Morgana, he uses light as a metaphor in support of his subjects and to enhance the drama. He employs techniques to heighten philosophical concepts about the principles and permanence of beauty and romantic love. His narratives also reveal characters in quiet and meditative moments of reflection. Peter Chan - Oil on panel, 2014, 20" x 16"
Born 1985 in Hong Kong. raised in Toronto. Received his Bachelors of Applied Arts from Sheridan College. 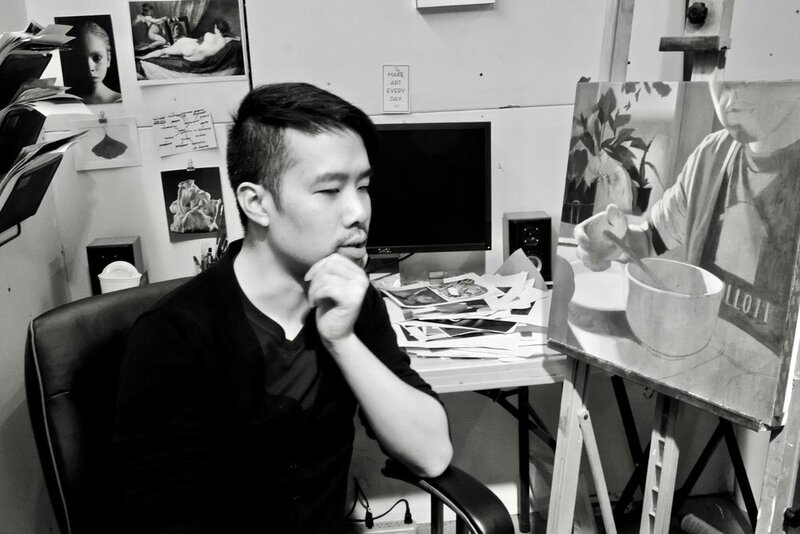 He is currently teaching at Ontario College of Art & Design University (OCADU), Seneca College, and Algonquin College. Peter Chan's work depicts narratives with characters showing quiet psychological states, often meditative moments of reflection. He is interested in exploring the psychology of solitary and romantic stages that is part of all of our lives.